​Rotting Christ presents new track "I Will Not Serve"
The Greek metallers Rotting Christ released a new song "I Will Not Serve" which will appear on the upcoming double compilation album of the band’s best tracks "Their Greatest Spells". The new release is reported to include the best songs of Rotting Christ, personally selected by frontman Sakis Tolis, as well as a brand new track "I Will Not Serve". The album comes out on March 23 via Season of Mist. 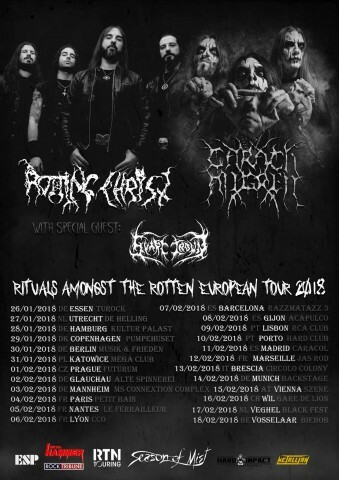 Read also: Review for the darkest album of Rotting Christ "Rituals"
From now until February 18, Rotting Christ will be on a European tour with the Dutch symphonic black metal act Carach Angren. All tour dates can be found below. On April 14, Rotting Christ will give a concert in Kyiv, Ukraine, featuring Odesa-based post-black metal act White Ward as a special guest.